$2.44 Winco BCS-10 Stainless Steel Bell Creamer 10 oz. $1.48 Winco SCT-10 Stainless Steel Server with Cover and Handle 10 oz. Easily add cream to your hot cup of coffee with the Crestware EL72 Elegante Pearl White Creamer 7 oz. Designed with a convenient spout, this creamer ensures consistent and mess-free pouring while its comfortable handle provides a secure grip. 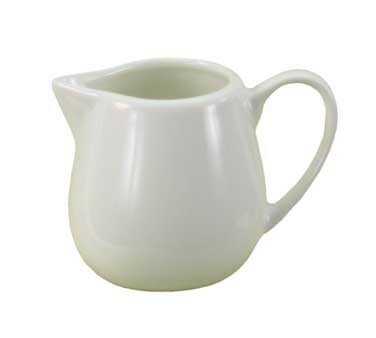 Thanks to its pristine white finish and seamless design, this creamer adds classic elegance to any table setting. Stylish, convenient, and durable, this chip-resistant creamer is made from glazed porcelain that withstands heavy duty use. 5.5 oz. - 8 oz.